Time to show you some unselfish sewing - although modeled by me. 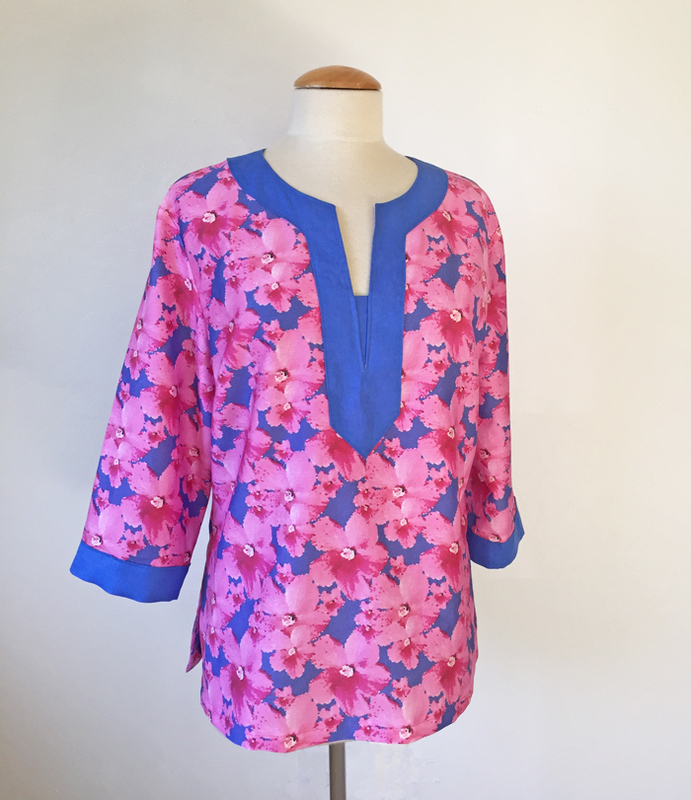 I made a tunic top for my mom using a fabric I designed via myfabricdesigns.com. I think this is my most successful fabric yet, with the caveat that I have two more waiting to be sewn up that are also really great. 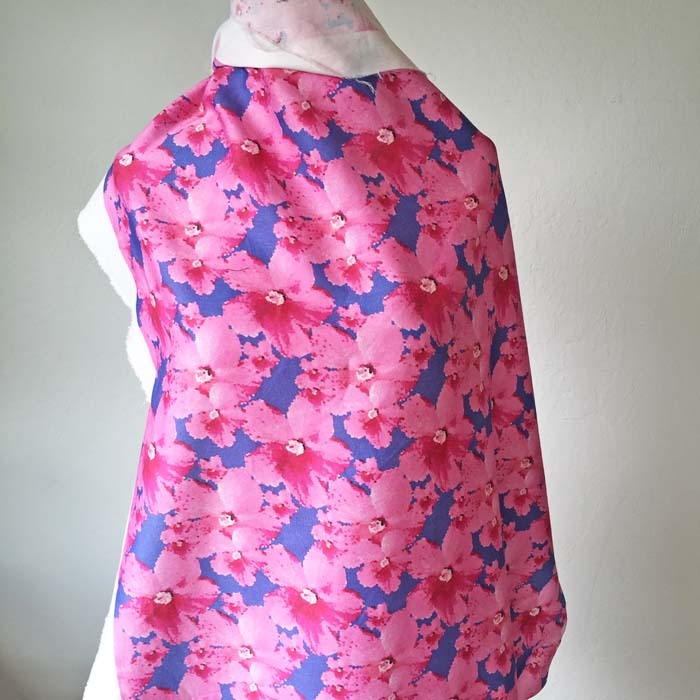 The floral might be a bit too much for some, but I was going for a Hawaiian style fabric based on my starting point, which was a photo I took of one of my hibiscus plant blooms. We took these photos around 7:00 in the evening, so the colors might not be as bright as in full daylight. But you get the idea! 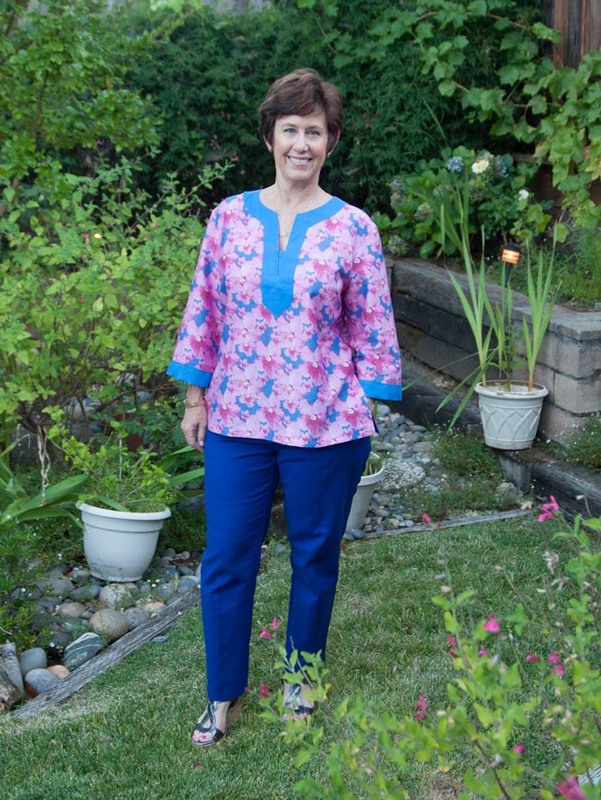 I have made so many tunic tops using this self-made pattern. 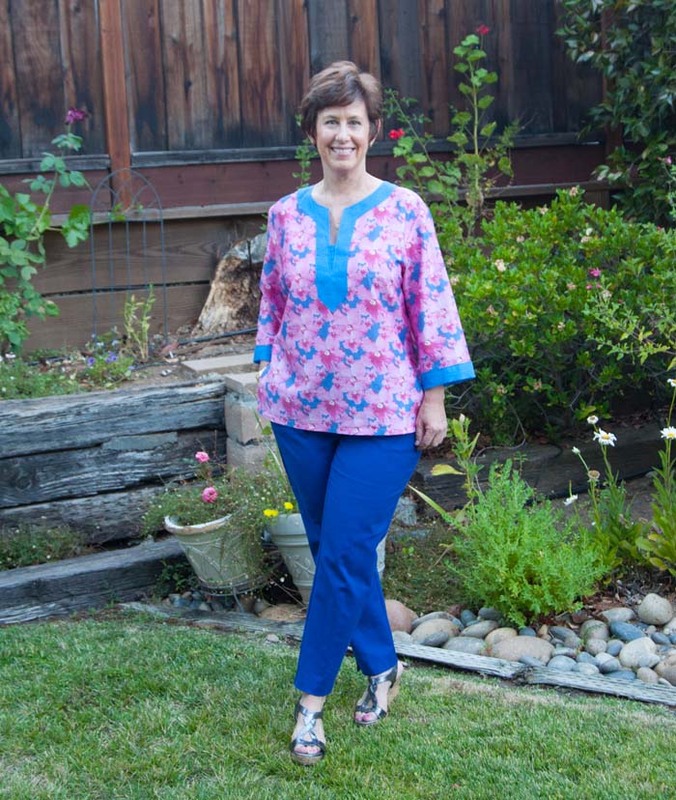 I created the pattern by copying a tunic top that my mom has which she bought at Macy's a few years ago. I will put links to the other tunic tops below. Here's a look at it on the dress form. I found the contrast linen fabric at Stone Mountain fabrics in Berkeley. I like to use linen for the contrast placket and sleeve bands on these tops even though I don't ordinarily like linen, but in this instance it gives such a nice crisp finish. 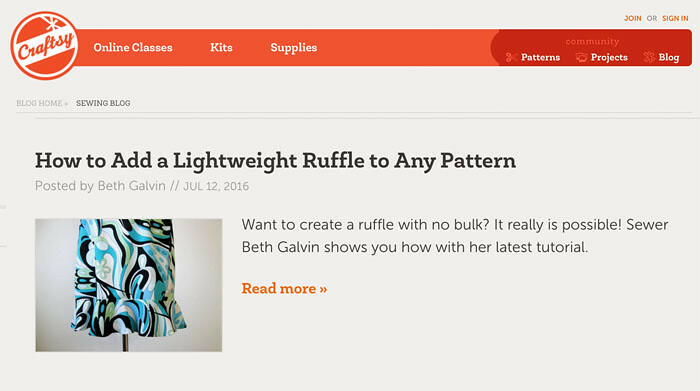 Have you wanted to design your own fabric? I find it a bit challenging as I am not much of an artist but once I got the idea to manipulate photographs then it was more fun. FYI: My Fabric Designs offered me an opportunity to try their fabrics so this fabric was provided to me at no charge. They have a design tool on their website, but I find it easier to create something in Photoshop and then upload the jpeg. I thought you might like to see some of the versions I went through in order to get this final fabric, so I made a collage of the various files that I had played around with until I got a final version. 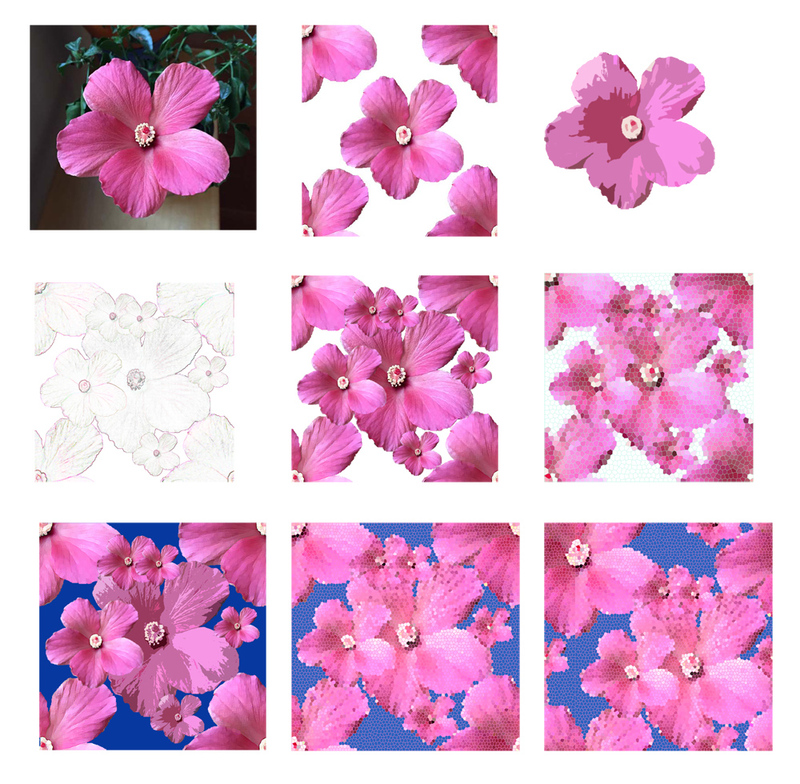 I started with a photo of a single hibiscus bloom, which I extracted from the background. Then I played around with the pattern repeat, and tried some of the various filters like colored pencil or cartoon, to manipulate the flower. I thought about extracting the shapes and then coloring it in but that seemed quite difficult. It seemed to need more to the pattern so I added the same flower in different sizes and layers. Once I had a layout of the various flowers I liked then I used the mosaic filter. That looked Ok but seemed to need a different background. So I tried different backgrounds and thought the royal blue was pretty against the pinks of the flowers. Adding back the mosaic filter I then changed the pattern repeat orientation and had my final jpeg to upload to their site. Here is the fabric before cutting. This is their cotton sateen - which is quite lightweight. 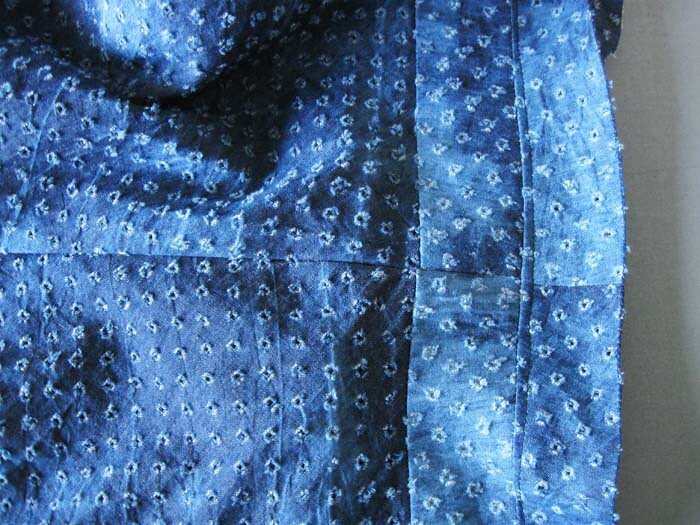 Most cotton sateens I buy are much heavier, I find that this fabric is much more similar to a cotton voile. As I mentioned in one of my prior posts about My Fabric Designs, if you are interested I strongly suggest you order the swatch book which is $ 5.00 and has good size swatches of all their fabrics so you can actually see what the fabric feels like and how the colors print on the various fibers. I have a piece of silk fabric that I ordered and the more I look at it the more I like it - consequently I am unable to decide how to use it, other than a top. I have 2 yards so plenty for a summer top, or even a long sleeve blouse. Pattern paralysis. Although it is kind of a summery color. I was at Nordstroms yesterday and took a spin around the designer department - I love to do that, inspecting all the high end stuff. In particular petting the Armani Collezioni. Yummy fabrics and soft tailoring. But I say a couple of Rebecca Taylor tops, very similar to the Vogue patterns of her designs, so I'm leaning that way. 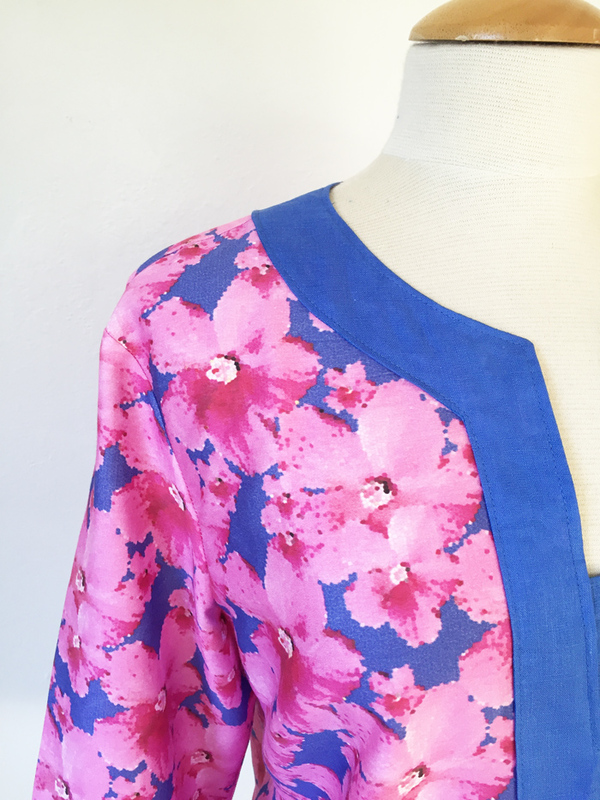 As for this fabric - I might just make another tunic top for myself! 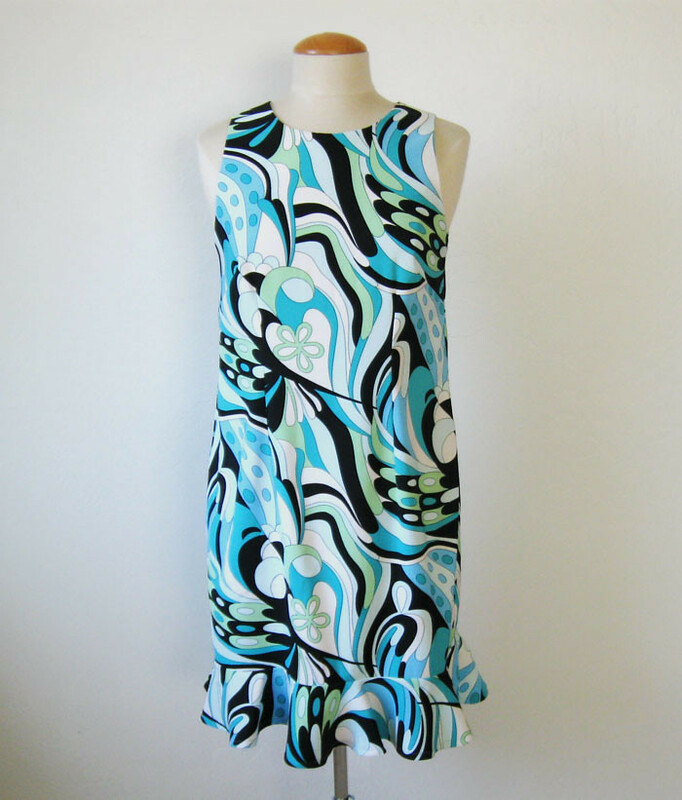 Here are links to the other items I have made using fabric from My Fabric Designs. and here are links to a lot of different tunic tops. 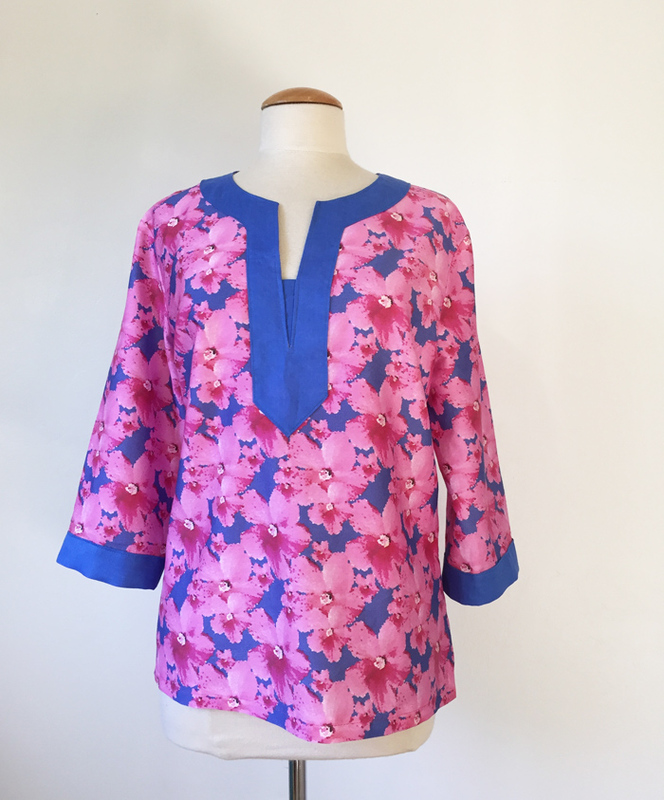 Garment clone tunic top - this is the first one I did. 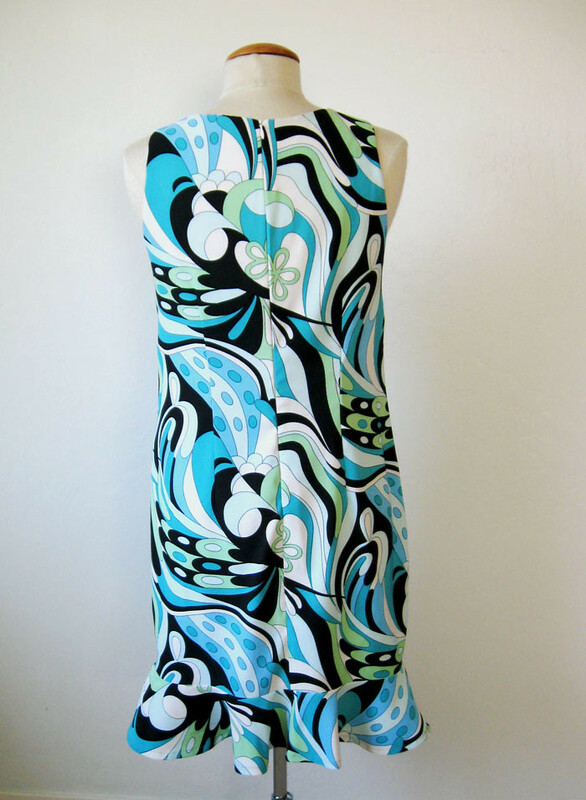 Rayon fabric from Girl Charlee tunic top - scroll to middle of post. and there are others but those are the ones made from this basic pattern. I wasn't that big of a fan of the tunic top style - I always thought it looked a bit 70's caftan, and not in a good way. But safe to say I am now a convert, in the right fabric it is a really great wardrobe addition. More tops coming up on the blog next, as I am trying to make separates after my recent run of dresses. 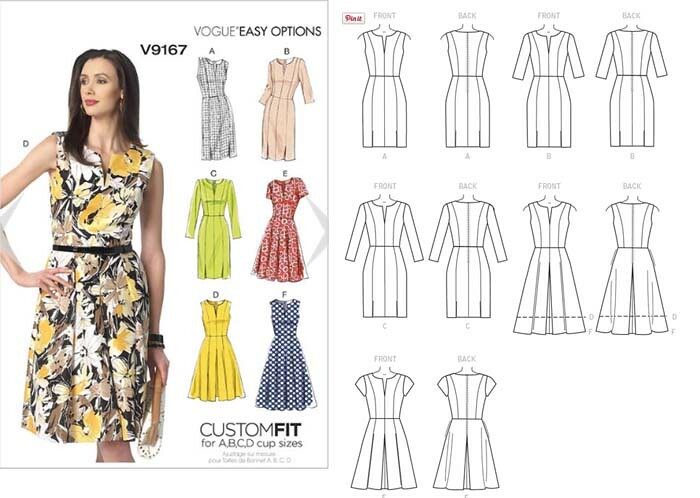 Not that a dress didn't sneak in there - which is a Vogue designer pattern repeat too! I will leave you guessing as to which one. Yes, 102˚F at 6pm. and now today is supposed to be hotter! After all we console ourselves with the time worn phrase "at least there's no humidity." Hey, I wish for summer so I can't complain. 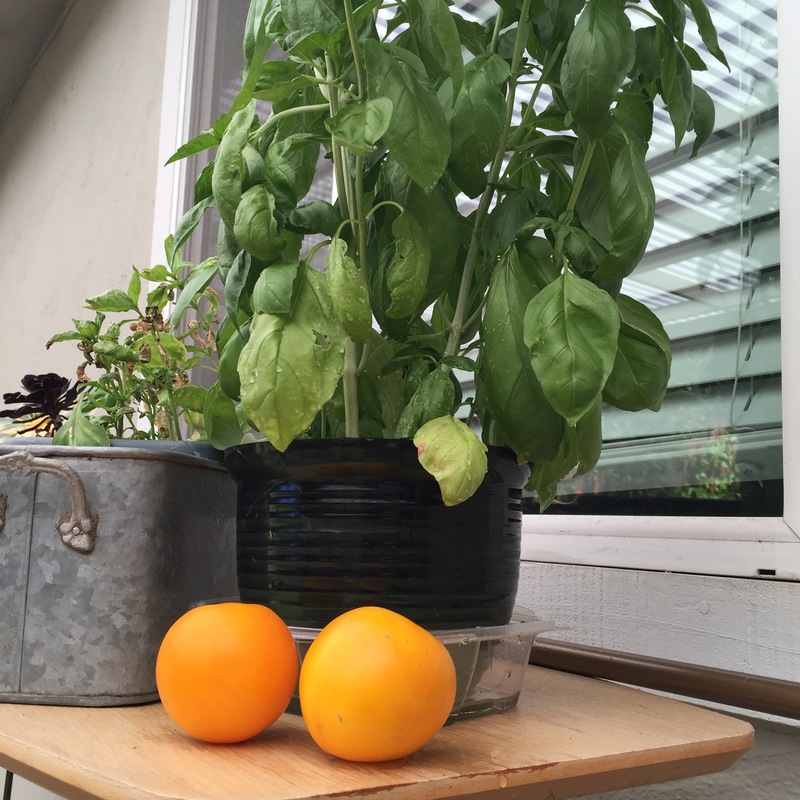 The tomatoes are ripe and my basil is growing like crazy. Last night I made some crispy pizza with basil, yellow tomatoes and goat cheese and then sliced it up and put it in the freezer. Perfect for a quick appetizer one of these warm evenings. To my great surprise a lot of you commented on my previous post - adding your voice in the debate between ruffle or trim. And the vote was fairly evenly split with perhaps a slight majority for ruffle. Which really surprised me - I didn't think anyone would like that at all. Speaking of voting - it's a long way until November with only a brief interlude of the Olympics to distract us. Please distract us!!! Thank goodness for the Olympics, I love them. The hunky swimmers, the amazing gymnasts, the split second drama on the track and so many other great contests. The broadcast does have a lot to get through but I do wish they would show a bit more of some of the less well known sports. Like synchronized swimming. Weird but fascinating. What sport do you like to watch? OK back to sewing. This is another item that I sewed in order to illustrate the topic for a Craftsy Sewing blog post. And a pattern repeat. When I first sewed this dress I did plan to come back to it and it has taken me 2 years but here it is. This is the Brasilia dress by House of Pinheiro, also know as Rachel, if you read her blog. I made this in 2014 and did a lot of pattern fitting. Here is the link to my fitting post and then the finished dress post is here. It is only available in one size but it is not all that difficult to fit, plus it has that interesting seaming in the front. 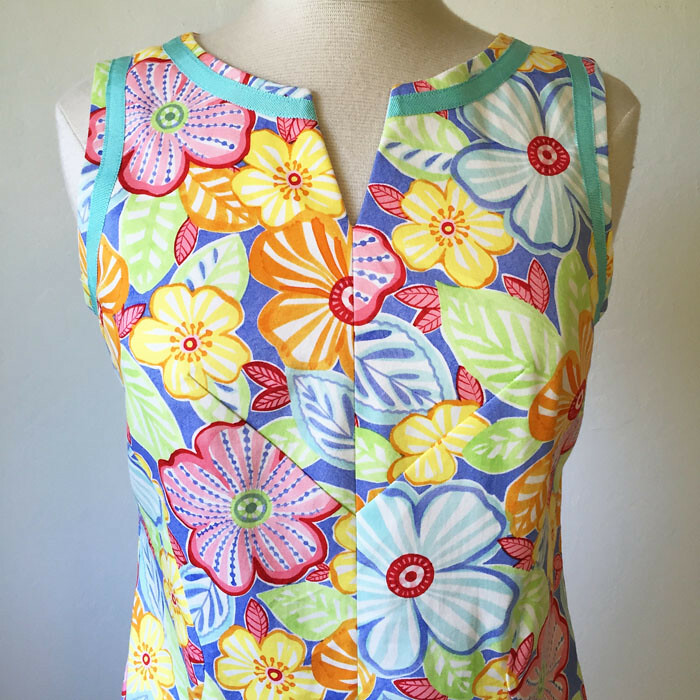 I used this slightly juvenile cotton sateen with 2% spandex. Which has been marinating in my stash for a while because I could only envision it as a children's dress. But one day I decided the flowers were hibiscus, which is tropical, which is just my style. Kind of a Tori Richard look (my favorite Hawaiian designer - their fabrics are so gorgeous). Plus I had the right color of ribbon in my ribbon box - purchased for something else but nice for this project. That is how my Craftsy blog posts go - either I am making something already and use that for a post or I want to do a post and then rummage around for the raw materials among stuff I already have. Here is the dress form pic so you can see the actual colors. I did make one change which was to lower the front neckline about 1/2 inch, since I felt the original was a bit high for my comfort, and then I decided to add the V neckline detail, which is super easy as there is the center front seam. 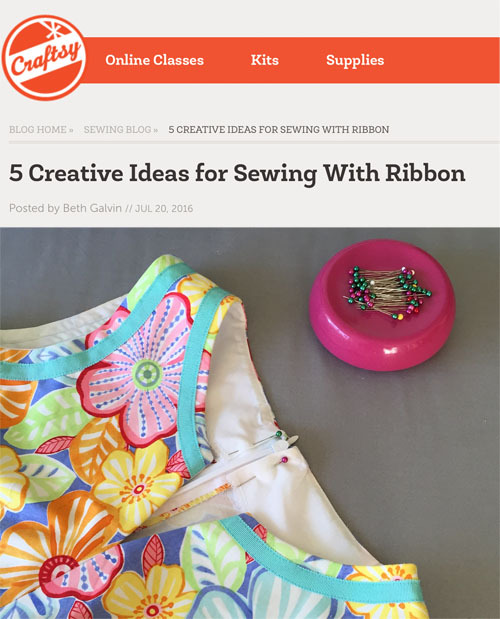 In case you can't tell - my post for Craftsy was about sewing with ribbon. I have a lot of ribbon which I always think I will use but so far not so much. The occasional ribbon sash or something like that but doing this post got me thinking about it and I have some ideas for incorporating a ribbon accent into a shirt. I read a post by Nakisha recently and she was commenting on the type of ribbon found on a ready to wear skirt that she had. I am pretty sure it is petersham ribbon which is quite different from grosgrain in how it behaves. You can shape petersham ribbon with the iron as you can see in the photo above, you could not do it with grosgrain. It is kind of hard to find petersham in chain type fabric stores but I am lucky that Stone Mountain has lots, plus I think you can find it at various places on line. Be sure to get petersham if you want to do this treatment. On the left, mint green is the petersham - see how the edge is not finished. 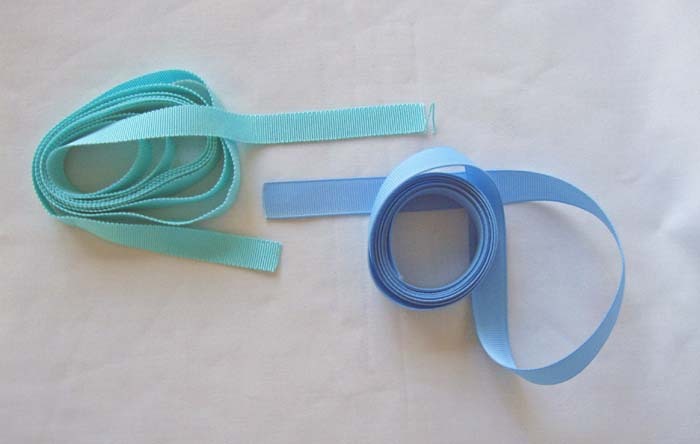 The grosgrain (light blue) on the right has that distinctive ridge and you could not bend or shape that no matter how hard you try. 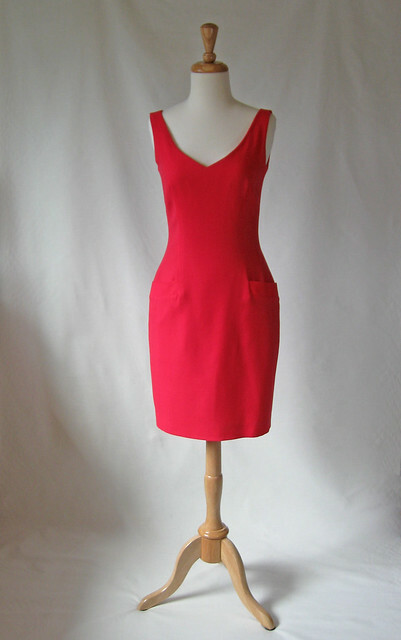 Back view, it is a simple sheath dress with waist darts. I did tighten up the center back seam about an inch at the very top as the first version gaped a bit there. This is such a perfect summer daytime dress for me - great for hot weather which we are supposed to have plenty of this weekend. I tried to make it a bit more fitted, sometimes I think I make things a bit too loose as I have a mania about stuff that is too tight, so like Goldilocks says - this one is just right. 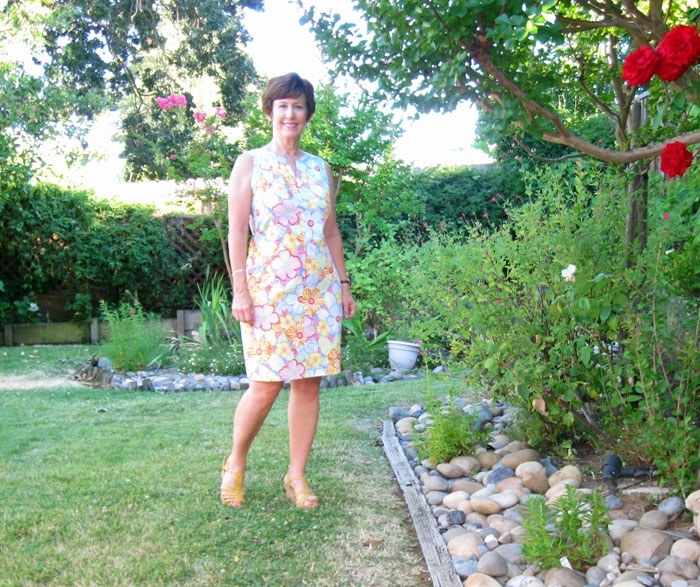 Just to prove that now and then I do like a ruffle, and that I am no stranger to wild tropical print cotton sateen, here is a link to a previous summer dress. Which I really like but every time I think of wearing it I feel that I will be dazzling people with the bright colors. So what, right? Sports. Ribbon. Wild tropical fabrics. All over the map in this post. As I said I have more ideas for using ribbon - as embellishment and also to create a lattice detail. Not sure if I will get to them but it's good to have those ideas swirling around. Happy Summer weekend - unless you are in the southern hemisphere, (talking to you Australia) where I have a sneaking suspicion that your winter is a lot like ours here in the bay area. In the sense that you can sew and wear a cute coat and get those gloves and scarves out, more for fashion than anything else but don't have to worry about frostbite or the polar express. Or maybe I have that all wrong. Anyway - we are heading in to the 100's ˚F so I plan to float in the pool and maybe catch up on some novels. 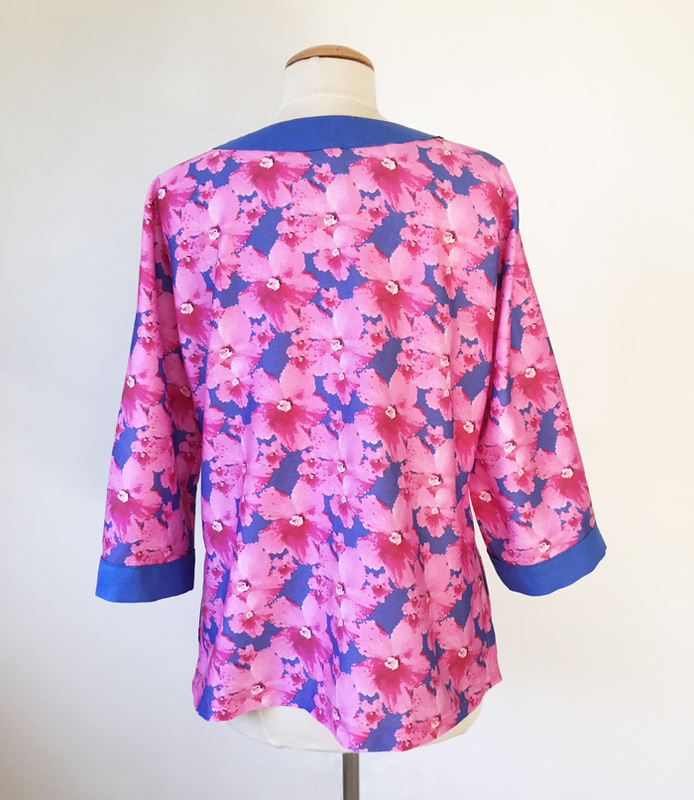 Sometimes when I am thinking up posts for the Craftsy sewing blog I start with an idea, and then sew up something to illustrate that idea - an example being my recent popover top. Other times I am making something and think oh, this would make a good post for Craftsy. Such as the hidden buttonhole placket or converting darts to gathers. Read through this post to see my refashion of a dress that hadn't even been worn in it's original ruffle version. Do we call that a pre-fashion? This dress is something I made because I wanted to do a post on circular ruffles. Although I wasn't 100% sold on the idea of wearing a dress with a circular ruffle - which I think you could also call a flounce. Funny how there are so many terms for the same or similar things in the sewing vocabulary. As it happened my pal Alice recently gave me a bunch of fabric she decided she would never use, with this eye-popping mod print among them. It is a bit crazy - however the colors are just to my liking. It's some kind of poly stretch which feels quite good to wear and would probably travel quite well - if you are going on a tropical vacation. (hey that's something I do - ok, this one might make it in the suitcase next time). Enough with the blather huh? Here is dress version Number One with the ruffle. Yes a bit wacky. And I felt like I was ready to enter the cha cha competition. Not that I know where one is. Just a mental picture. Here is the link to the Craftsy post on making this ruffle. As I mention in the post it is not limited to the edge of the garment - you sometimes see it on knit t-shirts, perhaps running diagonally or horizontally across to add some texture, or you can place it vertically. In the documentary, Valentino, the Last Emperor there is a scene where he agonizes over the number of ruffles on an evening gown and I believe these are circle cut ruffles. In any case the gown is gorgeous and if you have not seen that movie I strongly urge you to find it - eye candy for a stitcher plus some fun behind the scenes drama and insight. 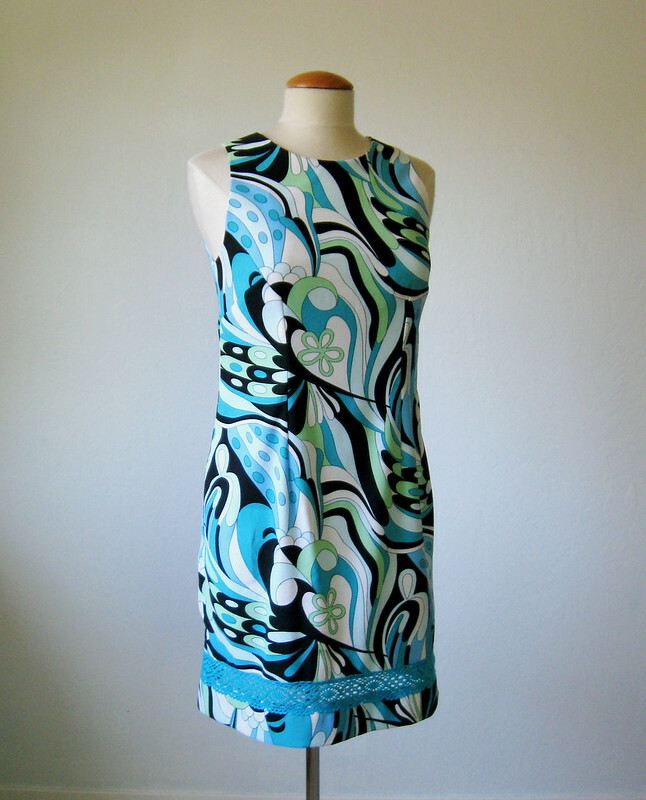 To make this dress I used my all-time favorite pattern, which is very simple but has some small details that I love. No way to count how many times I have used this pattern as the basis for something but it must be at least 15. The pattern has a copyright date of 1990 !! and I bought it new so I guess I got my money's worth. I saw it for sale on Etsy as a "very rare and sought after" vintage pattern for $ 25 but also saw a listing for $ 5 so I guess it depends on your point of view. 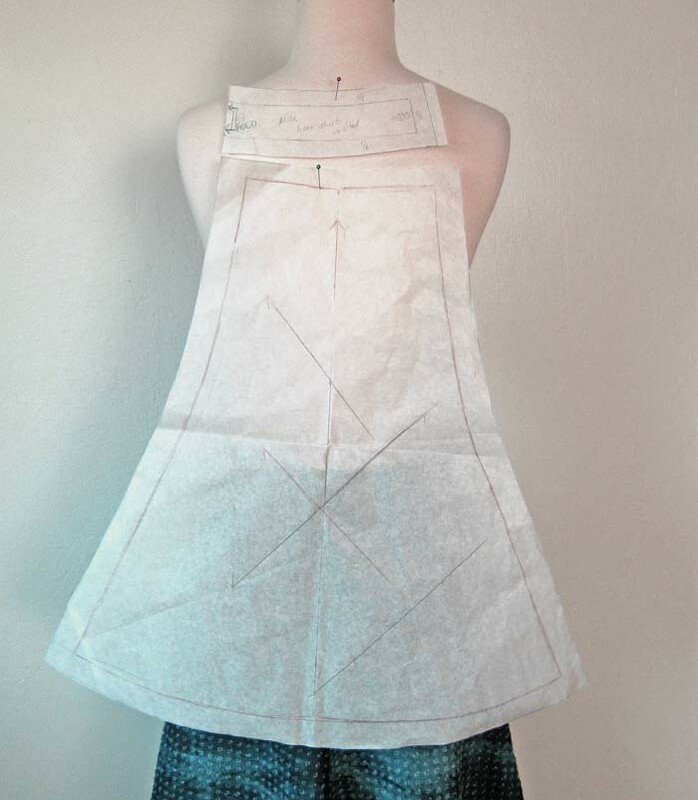 Dress form views, I made the version without the center V neckline. Of course one thing I like about this pattern is the cut-in armholes. Someone asked me recently on one of my shirt posts why I like this shape and how much to cut in. The why is perhaps personal taste, and just a way to be a little more bare without a strappy dress, and the how much I change each pattern on the fly. But usually just try on and then mark where my collarbone ends and that seems like a good spot. So once I had this dress completed, photos done and the Craftsy post written it sat on my dress form. Mocking me. Do your sewing projects communicate with you, in any manner? This one said "you like these colors but you will never wear it with that ruffle". And so I had an idea to change out the ruffle for something else. You can tell I took the second set of photos with my crummy Canon camera using the timer - not as nice as the first photo which my friend took with her far better professional camera. But you can get the idea. Since the ruffle was 4 inches wide the dress was too short once I removed it, however I had taken great pains to get it sewn evenly all around, so removing it left me with an edge that just needed an addition all around. I had been wanting to add some inset or open ribbon work to a dress for a while, and I found this trim at Joann's which was such a perfect color match. I know, I know - this might not be to everyone's taste but if I saw this dress in a little boutique in a beach town I would want it :) And as an aside - I have got to do something about the lighting on my photos. See above photo, wall is actually a very pale blue but never appears that way in my full length photos. I have to work on my photo location setup. And there you have it, a tale of two dress versions. No going back now as I have tossed that ruffle out. Let me know which one you like better - and don't worry, you won't hurt my feelings if you liked the ruffle version more! I think the more likely opinion is that the fabric is crazy. Crazy good, right? Hey all that difference of opinion is what keeps the fabric stores stocked with plenty of different looks for everyone. 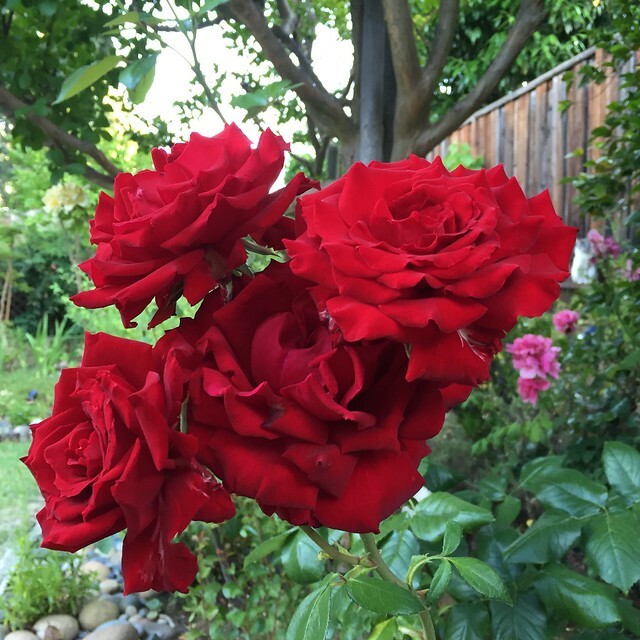 today's garden photo - just out of the frame in the last image is my precious red rose. Isn't this what you think of when you have roses in mind? This summer I have eyelet on the brain. 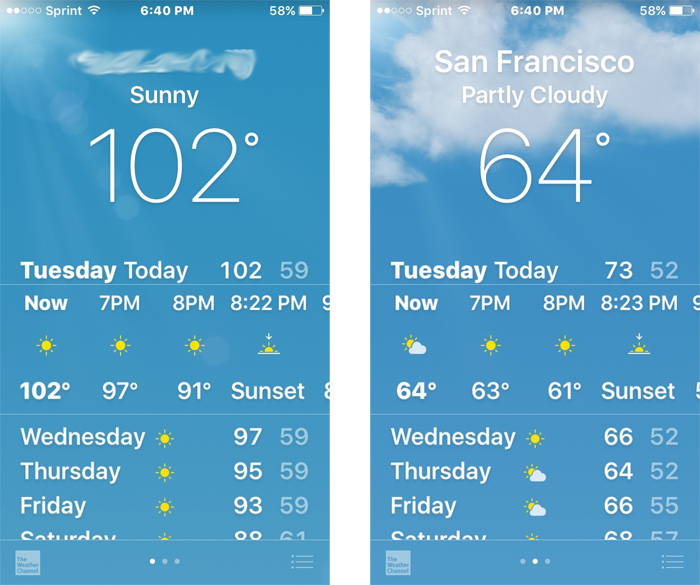 After all, it can get really hot here in my little corner of the bay area - like 110˚F hot. Although thankfully that is only once in a while. But we like our clothing with built in air-conditioning. OK - slight exaggeration but now that I have started I am on an eyelet kick and have 2 more items in the sewing queue. 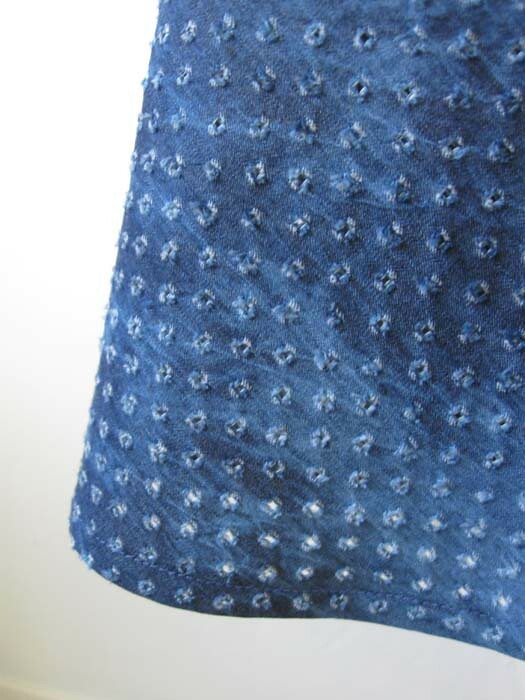 The first was this top and now I have made a skirt - also for my friend Alice - in this really cool denim eyelet fabric. A few weeks ago we went over to Stone Mountain Fabric in Berkeley and we both loved this unusual fabric. It is not really eyelet in that it doesn't have any thread or embroidery creating the holes, but instead is just perforated and I suppose washed/tumbled to create the texture. It also has the color variation, like a bleach effect so it looks a little bit tie-dyed, although not exactly. Whatever it is I really like it which is a good thing as I now have plenty of this fabric and will make myself a skirt too. Why do I have plenty of fabric? Because I created a pattern for Alice's skirt and then realized we hadn't bought enough fabric. When we were at the store she said it would be great for a skirt and how much to buy? 60" wide so I said oh, 1 to 1.25 yards or so would be fine. I think the piece was around 1.2 yards after I gave it a good wash and shrink. Seemed like plenty for a skirt. Then she brought over this skirt which is a Banana Republic linen bias cut skirt and said how about making a copy of this? 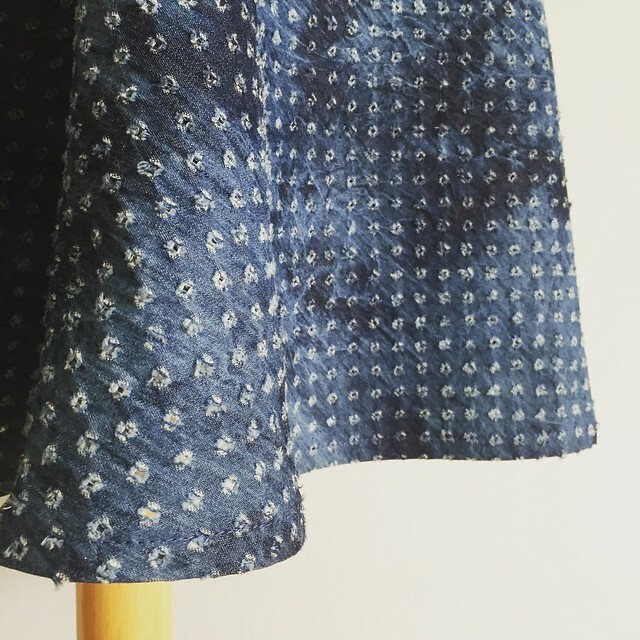 Seemed like a good match for this fabric so I got started making a pattern from this linen skirt. It is really simple, just four panels that are all the same. Cut on the bias which gives the skirt a bit of movement and a nice fit around the hip and waist. First step is to find the grain line which in linen is thankfully very easy. I do a thread trace along the grain line and that gives me the bias line for the pattern piece. 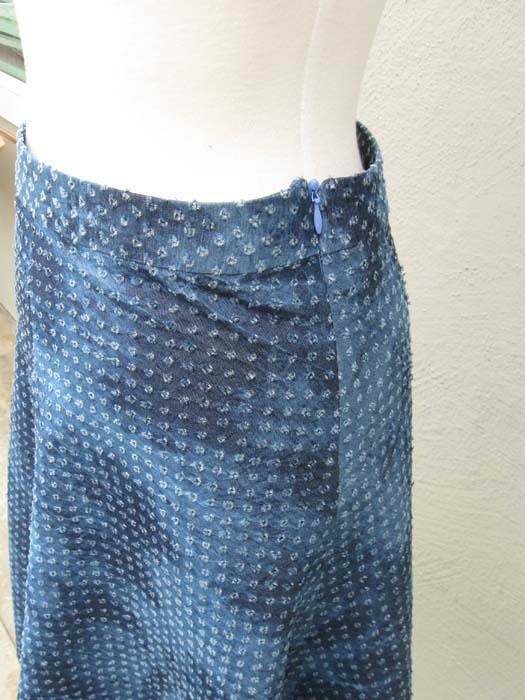 Of course this skirt has been worn and washed plenty of times, softening up and probably distorting the sections a bit but you have to start somewhere. I then traced the skirt section and then cleaned it up, folding it in half, balancing each side of the fold, measuring the upper edge and comparing to the sections of the finished skirt. 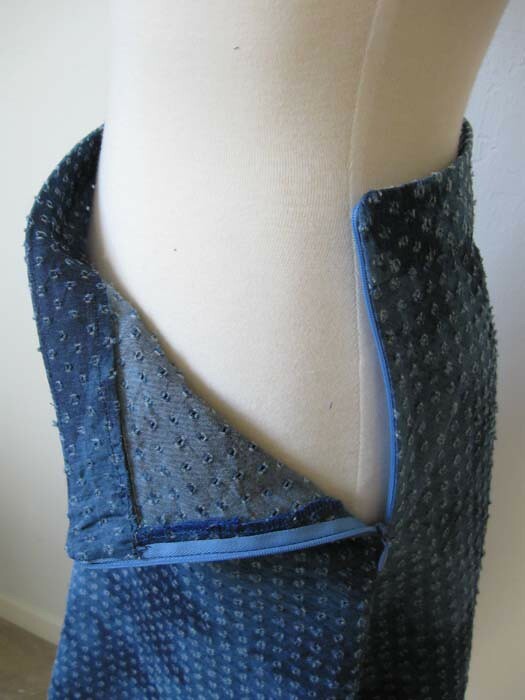 I find bias garments give you a bit more leeway with exactitude - something like this with only 4 pieces - all the same, will fit together just fine. I copied the waistband by tracing also, and then added 5/8" seam allowances to the upper and lower edges of the waistband but added 1" seam allowances to the skirt pieces and the waistband side seams.. Just for fit insurance on the skirt. Here is my final pattern. Now that is an easy pattern to store away :) The waistband is cut on the straight grain and then the skirt is cut on the bias, 4 of that piece. You can see I added more bias lines so I could easily place it on the fabric any which way to cut out. Which works on this fabric as there is no real pattern. In something more uniform you would want to lay them all out more carefully. Getting back to the question of enough fabric. So I got my pre-shrunk fabric out and started laying out the pattern pieces and determined I was short on fabric by about 6 inches. Aargh! Things cut on the bias tend to be fabric hogs and then things with that tulip skirt effect also tend to use up a lot of fabric so the combo here meant I needed about 1.5 yards to make this skirt. As she had mentioned she didn't want it any shorter - in fact wanted it to be about 2 inches longer than the original. So I made a quick phone call to Stone Mountain and asked if they still had any of this fabric - which fortunately is so distinctive that the person who answered the phone knew exactly what I was talking about. A quick trip over there - I bought 2 yards just to be safe and now I have the fabric remaining from this skirt plus our original 1+ yard which I didn't even use so I think a skirt for me is in the works :) I was thinking of using this pattern and adjusting for my size but I think I will reuse this pattern: (Vogue 1170 Rachel Comey skirt) and add the pockets which in my mind this pattern is lacking. All's well that ends well on the fabric front and then it was super quick to sew up this skirt. Here's a look at the waistband, with the waistband facing that I have under stitched so it will roll inwards. 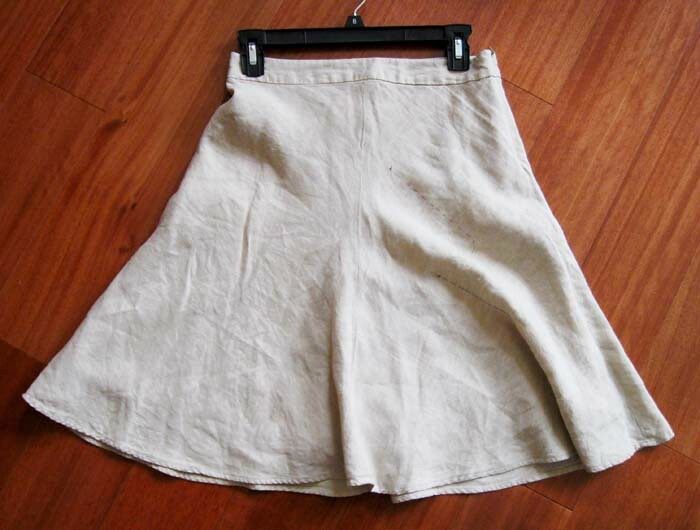 Her original linen skirt had a lining but we decided that this one can go without. You can't see through the holes at all so it doesn't really need it. For the waistband I knew it needed some support of interfacing but I didn't want to use fusible or even silk organza (which would have worked fine) but I wanted to use a cotton that had the same feeling as this denim fabric so when it was washed/dried it would behave similarly. I had some grey cotton voile in my stash so that turned out to work perfectly and it disappears behind the perforations. Here is the back view, not that there is much difference however I sewed it with the idea that the zipper would be on the left side. And the fabric on the back seemed slightly more stripey than the pieces that became the front, not that anyone would notice. 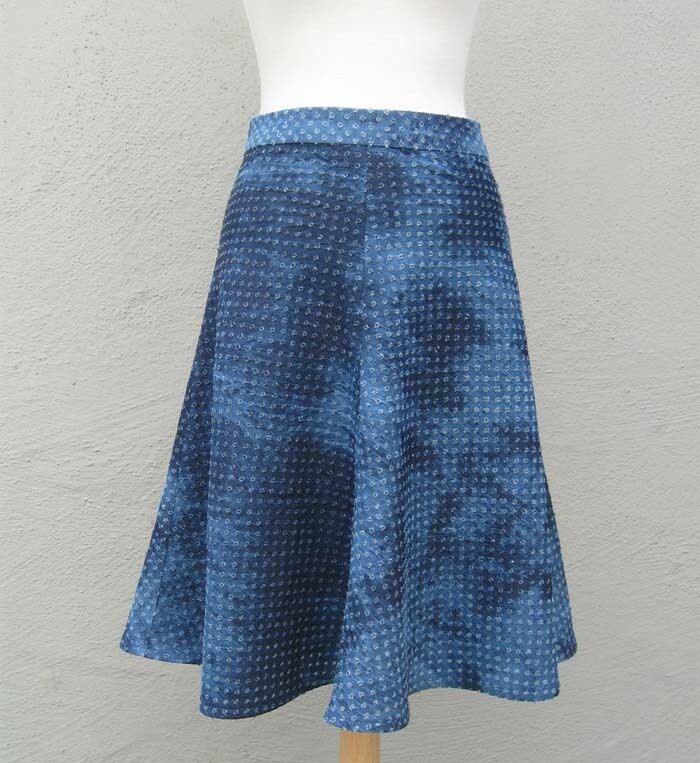 So that's my idea of an easy summer project - just two pattern pieces + something sort of denim = great summer skirt. Up next, more tunic tops, now that I have found the perfect pattern I have lots of ideas for modification to change it up. I have a couple of great fabrics from My Fabric Designs that need to be sewn up so that will probably be next. 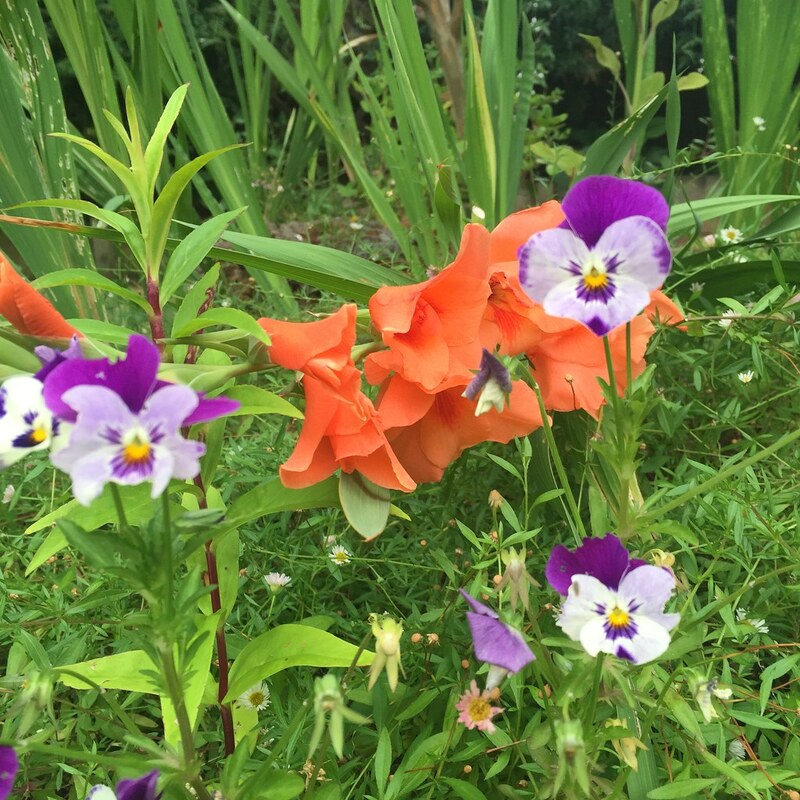 for today's garden photo, some cute pansies that are hanging in there, a gladiola that grew sideways but looks great next to those purples and a penstemon that refuses to bloom. 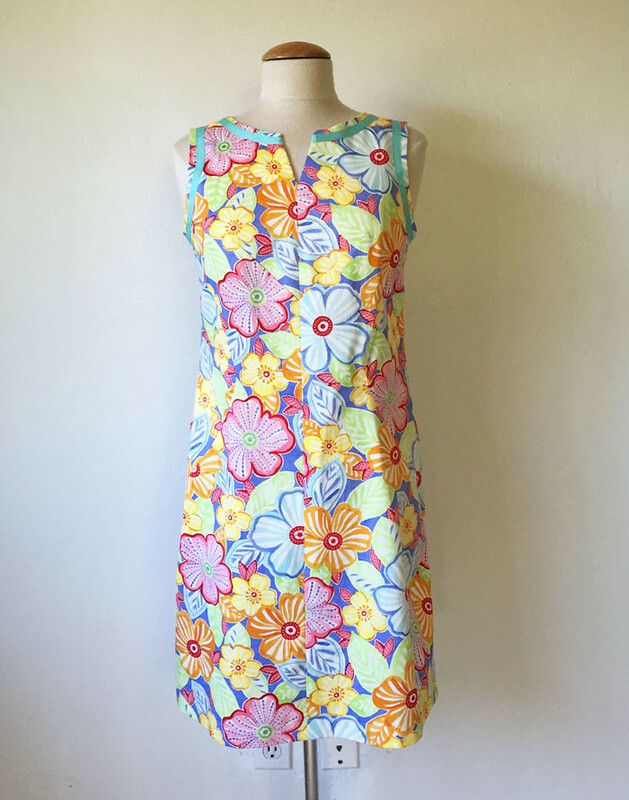 It's time for a new Pattern Whisperer post and since the topic is summer dresses I had better get moving. In case anyone is inspired to sew up one of these recommendations. 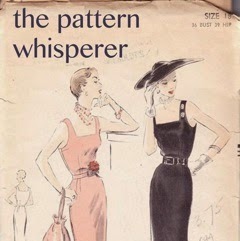 In fact this Pattern Whisperer is going to be very specific - a dress that is pretty, floaty, feminine, figure flattering. Enough adjectives? I have a specific type of occasion in mind with this one. It could be an on-the-casual side garden wedding, a evening party at a restaurant where they serve the drinks and appetizers outside at 6pm and the day has been scorching. A shower or birthday party where you want to look a notch above casual and show off your sewing accomplishments at the same time. Perhaps your stash contains a great cotton voile or sateen in a nice floral and want just the right pattern. Hopefully one of these will work for your summer event. By the way, a year ago I did a Pattern Whisperer on summer sundresses, and a lot of those are still in print so check that out for more ideas. And stay tuned if a full skirt is not your thing - when I was accumulating patterns for this post I found enough great sheath dress patterns to merit their own post - so that will be up soon. First up is this Vogue 9182 dress which probably takes a lot of fabric but looks quite easy to sew (if you don't mind making some buttonholes!) It has custom cup pattern sizes - how great is it that the pattern companies are finally putting this feature in a lot of their patterns. I really like the back of this dress, it takes it from basic to extra pretty. I love the gingham version - that would be so cute for a summer party and the black and white makes it more chic and less picnic tablecloth. This pattern gives a slightly vintage vibe without the pain of a single size vintage pattern. 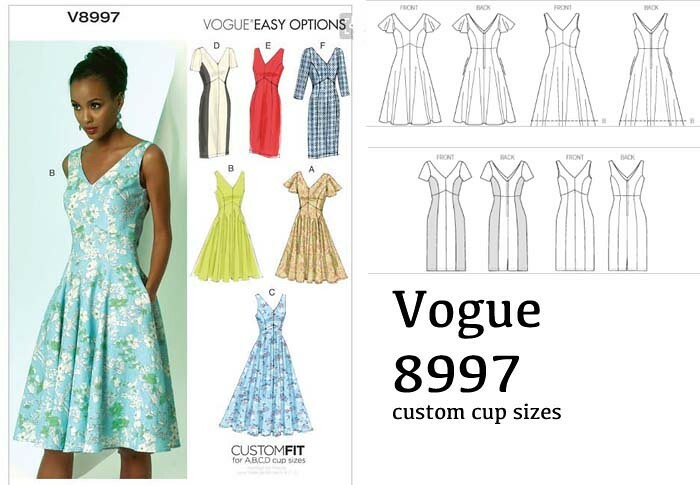 Next is another Vogue pattern 9167. This one is not so low cut as the previous dress but also has princess seaming and custom cup sizes. I really like the pleated skirt version. This pattern is very similar in shape to a lot of other patterns, example Vogue 2900 which is a great DKNY pattern that is out of print - so this one is a good alternative. Also Simplicity 2174 which I partially used to make this dress. 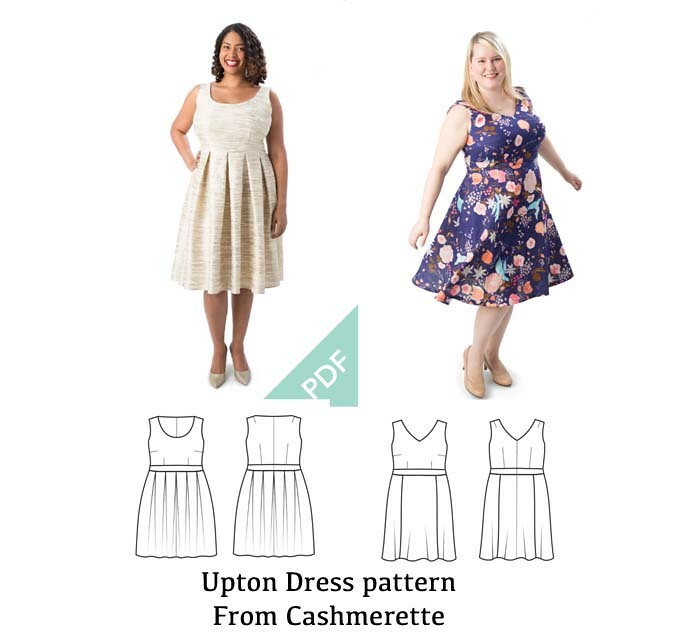 Speaking of custom sizing, I like the options in the new Cashmerette pattern, the Upton Dress. The neckline is very nicely shaped and I love the pleated skirt option, although the seamed skirt is nice also and probably takes a bit less fabric. Either way you can mix and match the bodice and skirt. I don't know how the pattern is designed, but if I were sewing it I would make sure the waistband is not one continuous piece but a front and back waistband, and then I would add a bit extra when cutting out the side seams, and then pin fit on the body to get a nice shape. I never like patterns that have you construct the whole top and then attach the skirt - just more trouble to fit. But this looks like a winner for the size range. This next one is a bit of a curve ball in that it is knits-only, unlike all my other selections. Although I will note that I have made plenty of things that were designed for wovens in knits with success - as long as the necklines etc are stabilized then why not? Anyway I always like dresses that have shirring, ruching, gathering, whatever you call it. They add visual interest and sometimes hide a multitude of sins! I even like the high-low hem in the main image. Kind of a fun way to do that trend and if you don't like it then hem it straight across. 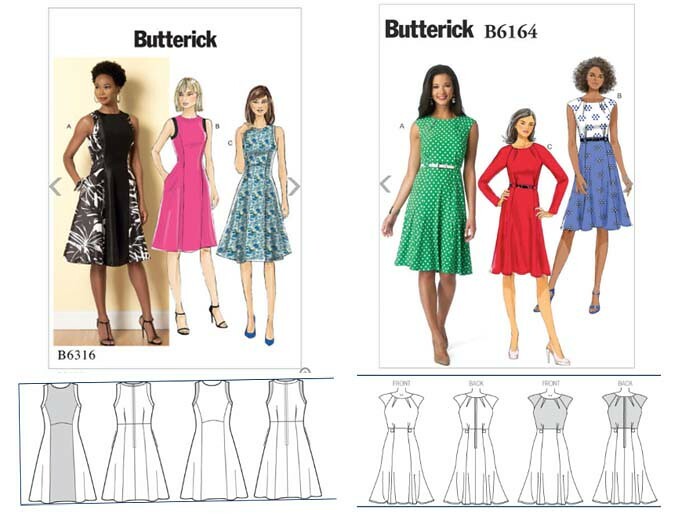 These next two Butterick patterns are a bit less floaty but still fit into the category of summery and not clingy. I love that color blocking options on the B6316 and the tulip skirt on the B6164 is one of my favorite looks. 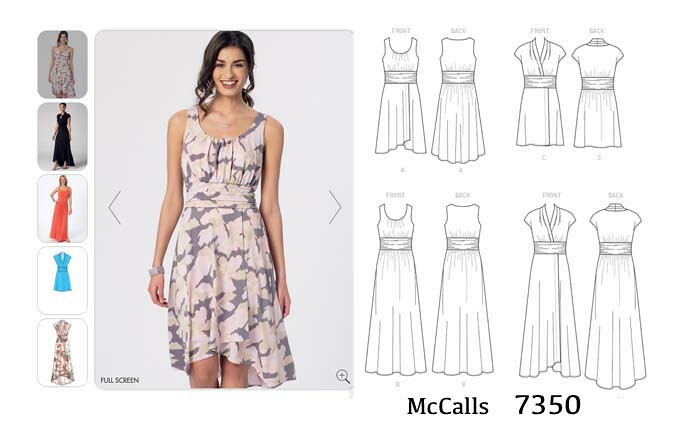 Also B6164 looks quite easy to sew and you can tighten up the neckline if that is a place where you have some fitting issues by adjusting the darts and the cap sleeve. Another recommendation from the Burda plus offering is this dress which looks simple but kind of fascinates me - as the side panels are cut on the bias. I have never seen that before and wonder if you could do that with any princess seamed dress to get the same effect which is figure hugging but not tight. I hope someone sews this up so I can see :) Also love that skirt with the flare - so pretty and kind of highlights some great shoes. This is a PDF downloadable from their Burdastyle website if you don't have the magazine. 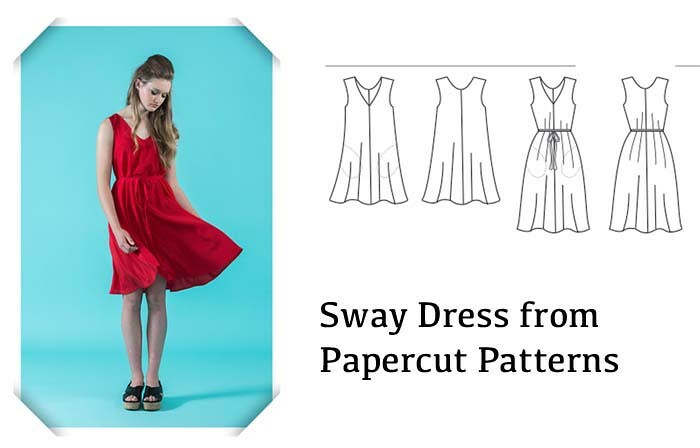 Here is a dress that I have seen a lot of versions online, the Sway dress from Papercut Patterns - and were it not for my already extensive pattern stash I just might order it. 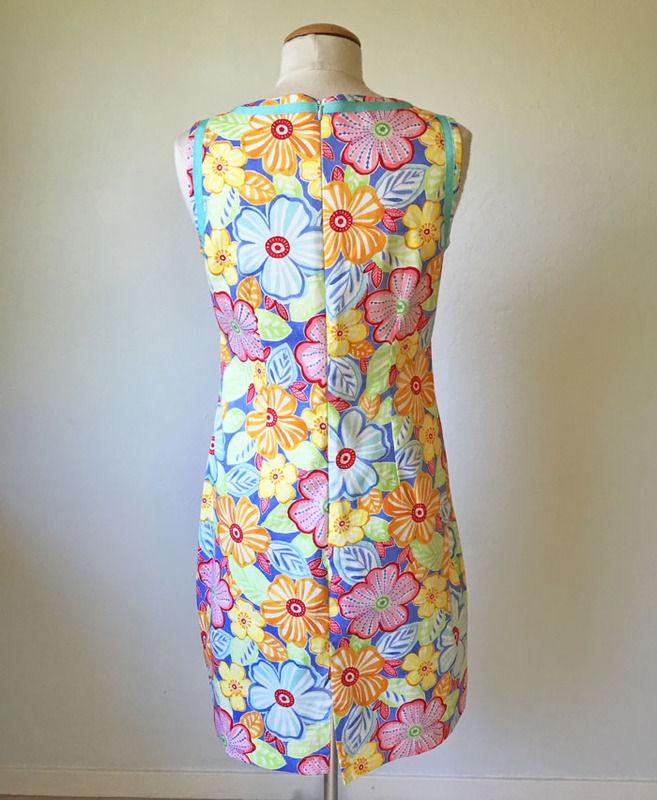 But if you want to sew a dress that has all the highlights - easy to sew, flattering, perfect for a vacation, shows off a great fabric, and leaves room for ice cream, then this is the dress. Super cute and yet so simple. I think I have talked myself into it. A couple more patterns to round out my selection. This one will make the list on the upcoming sheath dress Pattern Whisperer post as well, since it has custom cup sizes, choice of skirt styles, sleeveless or sleeve options. 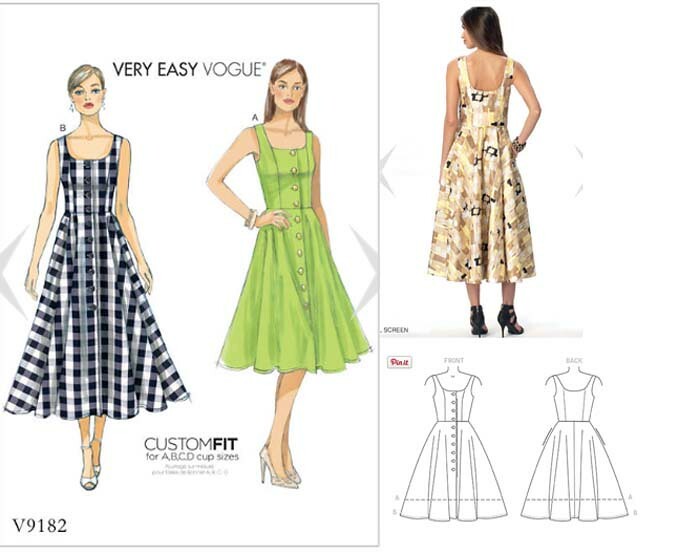 Check Pattern Review as there are 30 reviews on all different body shapes which look really great - also I want to steal some of those fabrics that have been used. 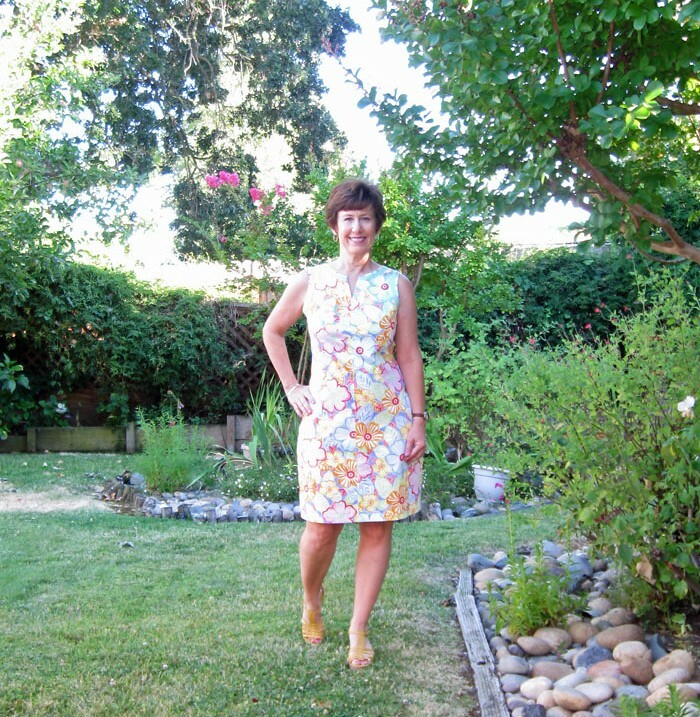 Lastly - thinking back I realize that I made a dress that fits the description here - a floaty full skirted summer dress, this Vogue 1353 which I think is still in print. I actually reach for this dress more than I expected - especially when it is really hot here a cotton voile dress is the perfect thing. This link takes you to the post for this version - which was my 2nd. And then links to the first version where I worked out all the fitting details if you are interested. There are so many dresses of this type available - you probably have one already in your stash. Both Simplicity and New Look have a lot of cute dress patterns - however their website is so bad lately that I gave up searching there. But I will give a thumbs up for New Looks patterns, their pricing can't be beat and they so often have a variety of views in the same pattern envelope. Today I finished a project that I have been working on for what seems like weeks - way too long but I kept setting it aside. In any case - done! and now I can move on to new things without feeling guilty. Up next a few things I sewed as examples for upcoming Craftsy posts - one of them is a great re-use of a previous pattern. 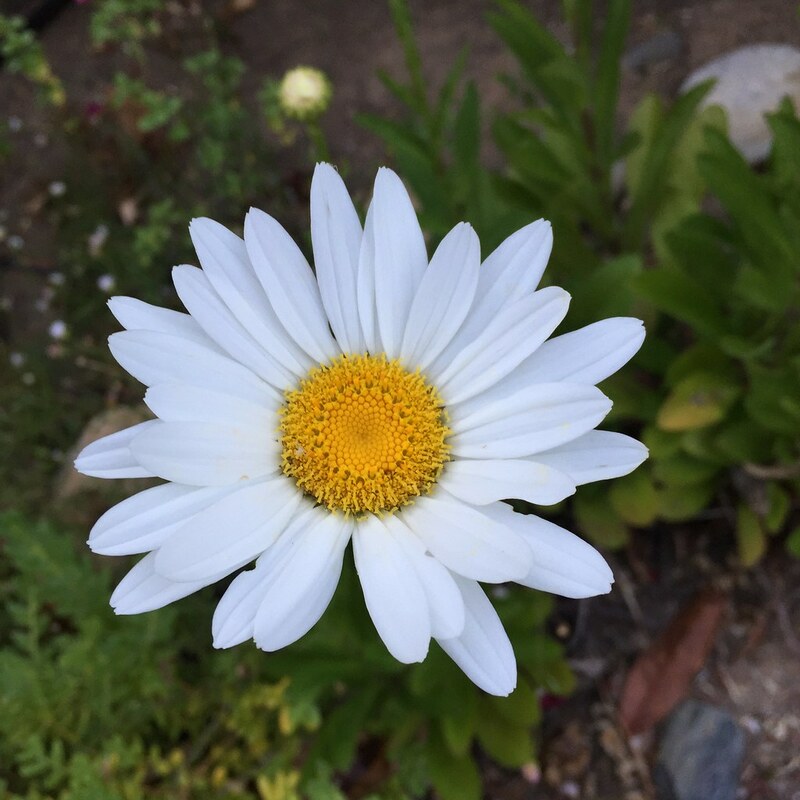 today's garden photo - I guess these are daisies? not sure but they are finally blooming. Well, I guess eyelet and a gorgeous color are a popular combination based on the response to my last post. Now I really want one of those tops for myself. 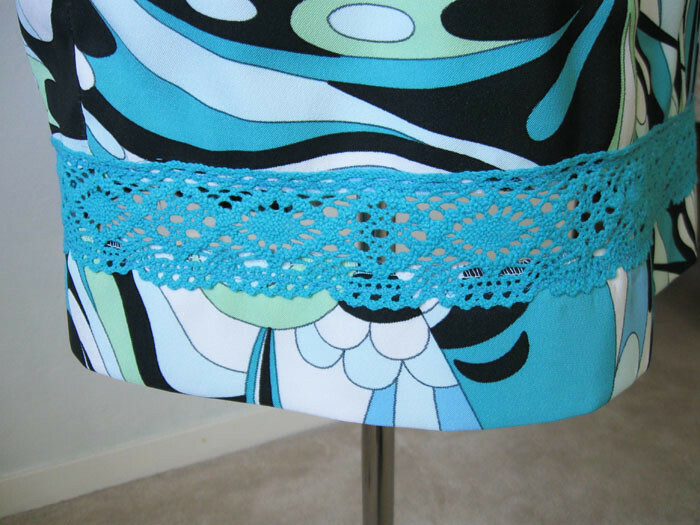 I have some turquoise eyelet fabric although it doesn't have that cute scalloped edge as the royal blue fabric had. Plus do I need any more turquoise items in my wardrobe? 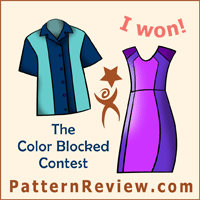 That pattern is a winner and has become my starter pattern for a tunic type top. Although that leads me into my first random threads topic - do you Sew With A Plan? Wardrobe Architect? What else is it called? Whatever it is I don't do it. In theory it is a good idea but I get way too caught up in some particular color or fabric that grabs me, or a pattern I want to try just for the sake of trying it. So a plan, rarely. Once in a while I do make something because I want it to function as a particular wardrobe piece, like a coat that works over a party dress, or a denim skirt with pockets that I know will be such a daily staple. But a plan - I don't know - seems like it would take a bit of the fun out of it. I guess for that same reason I don't sew everything - especially things like gym wear and swimsuits - just so much easier to buy them and then I can focus on stuff I enjoy making. ModelistA Website - I don't know how I came across this site but I really like it. 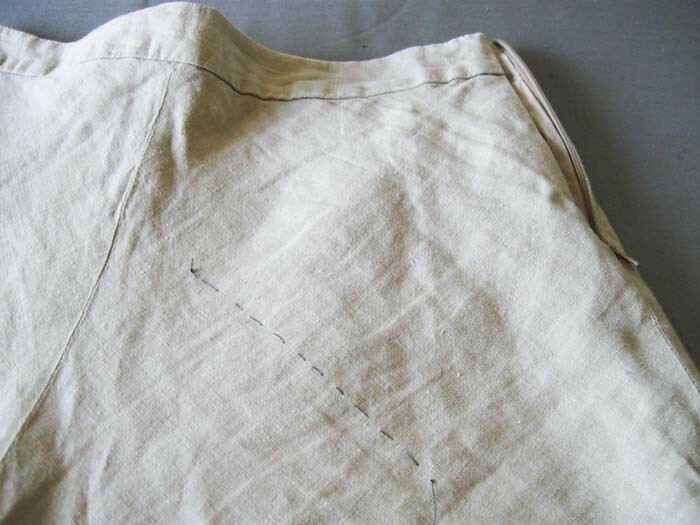 (mmodelista.blogspot.com) They post often and show a design and then an illustration of how the design is achieved via manipulation of a basic sloper. It could be a jacket, a dress, knits, kids, etc. The notes are very short and also in Portuguese so I usually just look at the drawing and they are really informative. Reading this post for some reason I decided to read the paragraph so put it into Google translate and it was very entertaining - I don't know if the text was written that way or garbled by the translation software, but here is part of their description of what was a simple 60's style shift dress: "Besides being a wild card play, the right dress is for any body type, it does not show any specific curve. A relief for the chicks is not it? After all, no one deserves to go without eating one chocolatinho just to wear a bandage dress. With a few tips you can create stylish looks for different occasions using the straight - cut dress"
Now I am wondering what I have been missing every day by not translating the text. And could not agree more about that style of dress, a relief for the chicks! Clear Elastic: this is a product that baffles me. I see it used a lot, for stabilizing seams or necklines. I even bought some to have in my elastic stash. But I have never used it and also not come across any reason to. When I have had ready-to-wear clothes sometimes the clear elastic is kind of pokey and always just in a spot on the neckline where it irritates to the point where I actually extracted it from one t-shirt and resewed up the seams - achieving much improved comfort. So let me know if there is some secret use that I don't know about. Also - I don't construct garments with the serger so perhaps it will never get used in my sewing. 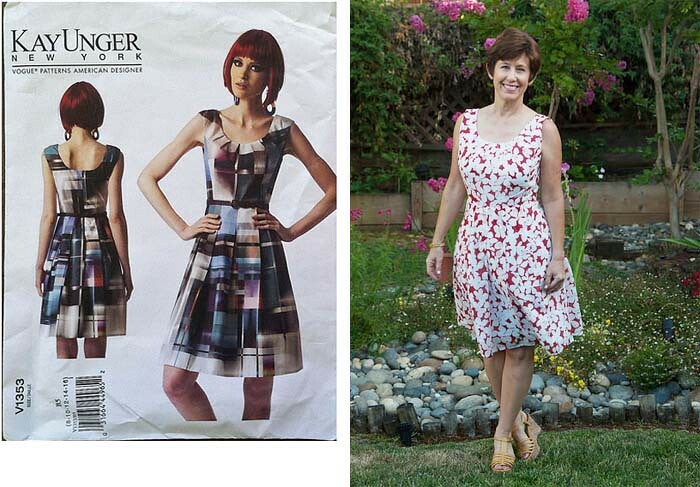 Pattern Whisperer: I am working on two different topics, summer skirts and then dresses to wear to summer events. Which I had better get moving on as summer is flying by already! And since this post is lacking a photo so far, here is a sneak peek of a skirt I just finished for my friend Alice. Using this super cool denim eyelet fabric we found at Stone Mountain. And now I have enough remaining fabric to also make a skirt for myself. 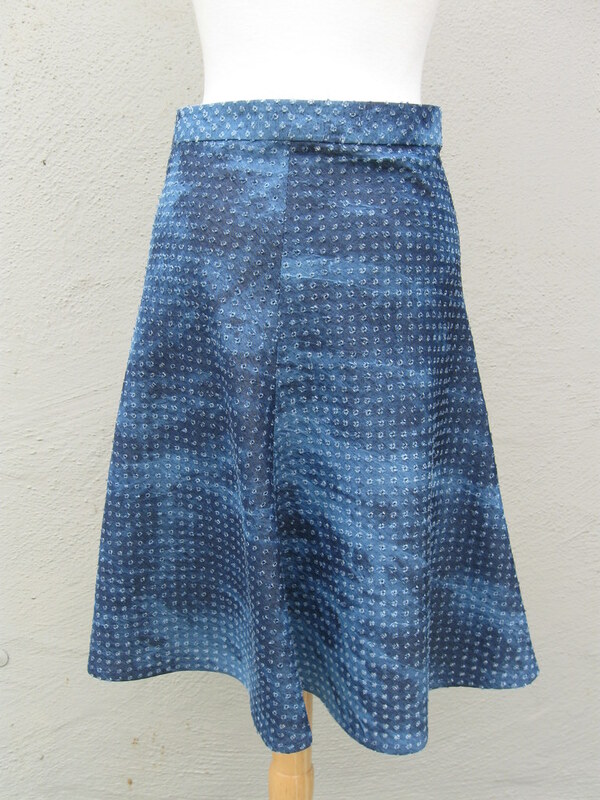 For this skirt I made a pattern via copying a older linen skirt she had from Banana Republic. Stay tuned for a post on copying - in this case it was fairly straightforward although the original was on the bias - as this one is. Fabric not a favorite? Is there a fabric you don't like? Or actually the question I am thinking of: is there a fabric you just don't get? Like why is it so popular? this may be slightly heretical to say as I see it is extremely popular but the one fabric that I don't get is double gauze. To me it doesn't seem like garment fabric. Or maybe that explains the popularity? It seems a bit limp and lifeless. I have seen it recently in my favorite local fabric stores and while it is great that the inventory is so varied it just doesn't appeal to me. And here is another one, Liberty fabrics. They are nice but I don't see the value for the price. Or maybe I'm being silly as I do see the value in an extremely expensive Italian silk or wool. I guess it is just what type of sewing each person does and then what fits into your own expectation of cost vs. value. History Podcasts. So what does that have to do with sewing? I listen to a LOT of podcasts (the other day I forgot my phone when I went to the gym and actually thought about going home to get it - but opted to do a workout without any aural entertainment - oh the suffering, ha ha). I heard a really great episode the other day on the history of fashion in France during WWII. It is the Stuff you Missed in History Podcast, they have done a number of their podcasts with a fashion related topic. That link goes to that subcategory. It was fascinating. They also have old episodes on the history of knitting, on Schiaparelli, the House of Worth, and Paul Poiret. Check it out if you like the intersection of history and fashion. I also listen to the History Extra podcast from the BBC, and they have had some that include fashion info. Although a really interesting episode from a few months ago was about the history of red hair. Angle of Darts. What does that mean? I didn't know how else to start this paragraph other than to straight out say it - there are some patterns where the angle of the bust darts looks so wrong to me. Mostly the angle is lacking - in that the bust dart is almost horizontal - going straight from the apex to the side seam. Am I the only one that thinks this looks weird? Like a children's drawing? Also I see on some patterns that it is too long, so the end is way too close to the center. My feeling is that the bust dart should kind of disappear from view if it is doing its job correctly. I have definitely changed the angle of the dart if I think it looks too straight on. I think it creates a more flattering shape and line if it angles down toward the side seam. And don't think you have to leave the dart as is in a pattern - check where it lands on you and move it up or down, or make it shorter, or change the angle. This is another reason why I cut out 1 inch or even more on the side seam allowance, so you can play with the darts if needed and fit as you sew. Swimsuit styles: I keep saying I will never make a swimsuit but this just might be the year. Mostly because two years ago I left my favorite swimsuit outside to dry after a swim over at my parent's house. Our lifetime habit was to drape them over a railing to dry, but for some reason we all stepped outside after changing and put our wet suits on a wooden bench which encircles a tree in the middle of the deck instead of on the railing over by the pool. And then the next morning my mom phoned and asked "did you really like that blue swimsuit you were wearing yesterday? Well that didn't sound good. As it happens some raccoons were making themselves at home below the wooden deck and they pulled a bunch of stuff under with them during the night, including some suits and beach towels. Most everything was recovered with a lot of effort but the top to my favorite swimsuit disappeared never to be seen again. I was so mad as it was a specific style I searched for and finally found in a shop in Hawaii. Today I was at Macy's and saw something similar but not quite, so the battle may be lost and I will get going with sewing one, or at least just a top. I am a mix and match swimsuit person, and forever a bikini wearer and have plenty of bottoms. Although they are not quite as bikini as they used to be :) One-piece swimsuits just feel strange to me, I think I have only worn a 1-piece for scuba diving or water skiing. In any case I had better get going on this project. Vogue DKNY patterns: suppose it was inevitable but Vogue patterns is discontinuing and no longer selling the Donna Karan and DKNY patterns. They have had a good run and I would not be surprised if her patterns were consistently at the top of the sales chart in their designer line. 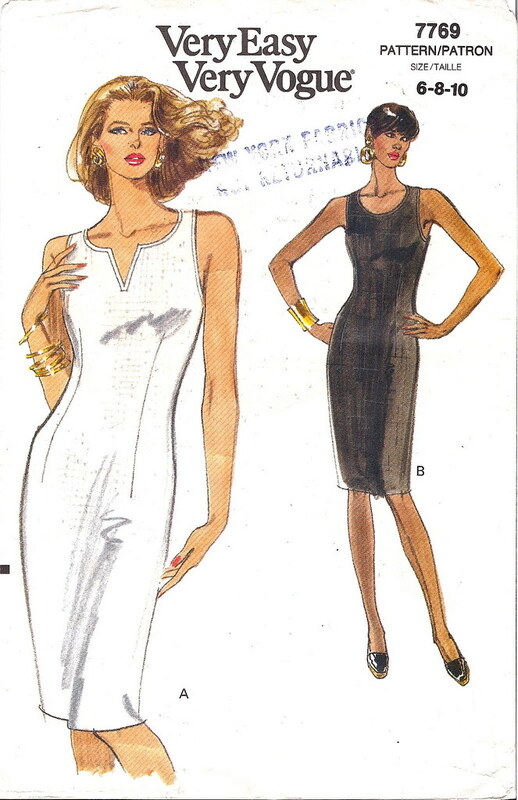 I have made some great ones recently and going back many years - if I think of my first work wardrobe I remember sewing a DKNY blouse pattern many times. My all time favorite dress that I have sewed is this one, which is a DKNY pattern. I wonder if these patterns will go up in price on eBay etc. like some of the other designer patterns have. The styles were often so cleverly designed, both inside and out, and also the shapes while simple could be ultra-flattering, sophisticated and yet comfortable at the same time. That is quite an achievement. Happy weekend sewing, and a great 4th of July holiday to everyone celebrating in the US. Long summer weekend! fireworks! barbecues! Pie making! Ok that last one might only be me. 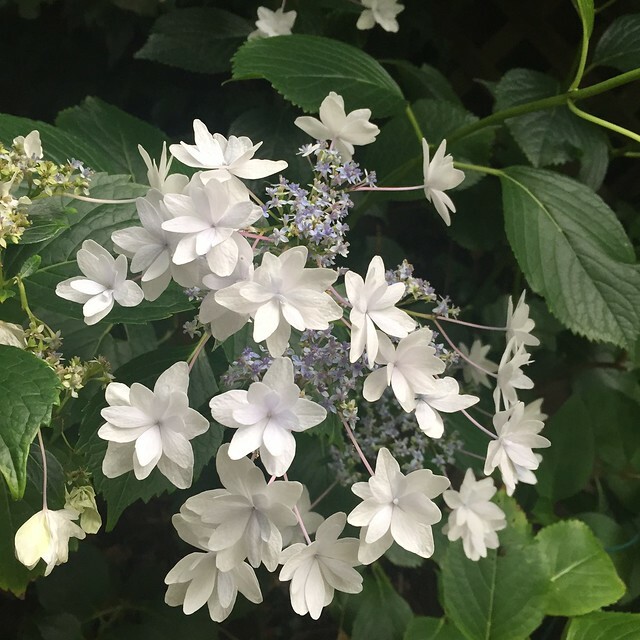 today's garden photo - Shooting Star Hydrangea - this one was a tiny baby plant just a couple of years ago and now it is finally thriving. I love how the blooms look like fireworks and they move in the breeze.